The P3000D is a pedal system so advanced, so well engineered that it becomes an extension of your body. Whether seeking to deliver lightning-fast blast beats or deep, rock-solid grooves, this pedal offers the adjustability to maximize your playing in any style. The Fastest, Smoothest, Most Versatile Pedal In The World. The two position direct link adjusts for a choice of light or heavy feel. This creates the most seamless link between the player’s musical ideas and their execution on a bass drum. The Ninja Bearings were originally designed by skateboarding engineers, these bearings feature micro-polished steel balls for amazing speed and incredible smoothness. 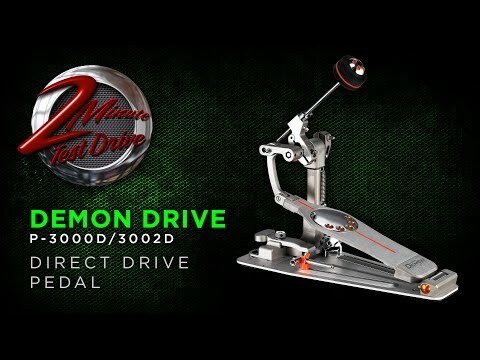 The most unique feature of the Demon Drive pedal is Pearl’s exclusive Duo-Deck, the world’s first convertible footboard. Through a simple adjustment, the Demon Drive pedal can be adjusted from a traditional shortboard to a longboard pedal in seconds, offering a slightly lighter, quicker feel that is the preferred setup when speed is a necessity. A choice of two positions for a finesse or power feel. Simply loosen the clamshell to change position. The Click Lock prevents the tension knob from loosening no matter how hard you play. Simply flip up the lever for adjustment. The Aluminum Traction Dots are fully adjustable to vary the amount of slip or grip for your playing. The P3000D is also available in a double pedal model, the P3002D and P3002DL for Left-Footed Players. The P3000D, P3002D, and P3002DL pedals come standard with Custom Carry bags. The P3002D is a pedal system so advanced, so well engineered that it becomes an extension of your body. Whether seeking to deliver lightning-fast blast beats or deep, rock-solid grooves, this pedal offers the adjustability to maximize your playing in any style. The Fastest, Smoothest, Most Versatile Pedal In The World. This pedal also introduces the world’s first two-position Beater Stroke Adjustment. The two position direct link adjusts for a choice of light of heavy feel. The P3000D and P3002D pedals come standard with Custom Carry bags. P3002DL is the Left-Footed Version of the P3002D. Purchase Pearl Demon Direct Drive products online!